30 to 1 mix with Water..
Coolant for Drilling, Tapping, Threading, Turning & Machining. Speeds up Drilling and Tapping Opera..
Water soluble, fully synthetic cooling fluid. Exrends tool life of the pipe end preparation machine..
A low melting point metalworking compound for use with all metals, including the more difficult meta..
Metal Lube Cutting Fluid for all slow speed machining including Reaming, Tapping,Threading, Drilling..
Metal Cutting Lubricant which Doubles Tool Life. High Performance Lubricant for Reaming, Tapping & ..
High Performance Lubricant with PTFE. 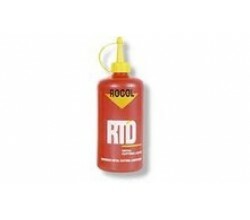 Designed for the General Lubrication of moving Parts such as ..
Low Odour and Anti - Mist Formulation Maintains Workable Viscosity for Cold Weather Threading to -1..
High alloy mineral oil based thread cutting oil. Developed especially for cutting threads. Very hi..
To be used in Concentrated Form. Guarantees Continuous Threading. Extreme Endurances of Tools and H..